I first saw this guy a few weeks ago, and I wasn’t even aware of how special he was (you can see that story and photo on my MS Photography page). But he’s been coming back just about every day. And he’s brought a male and a female friend. 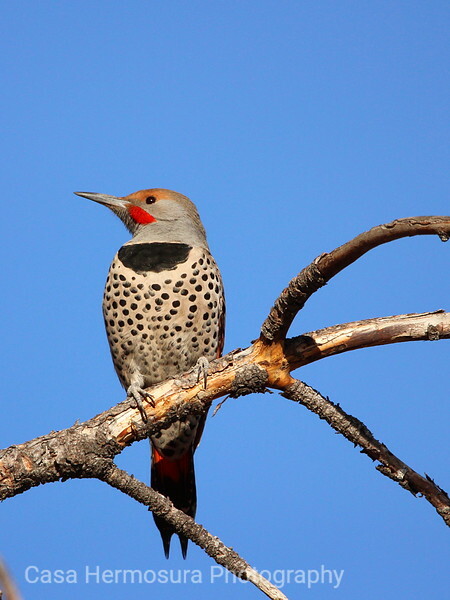 His friends are straight up Red-naped Sapsuckers, but the extra splash of red on this guy’s check (right behind the eye), and the dribble of red dripping down his black bib, suggest this one is likely a hybrid. He and his friends are absolutely killing my aspen trees, but they are so comfortable with my approach and so pretty to have around, I guess I’m just not that concerned about my trees. Sometimes, just a walk across the street pays off. 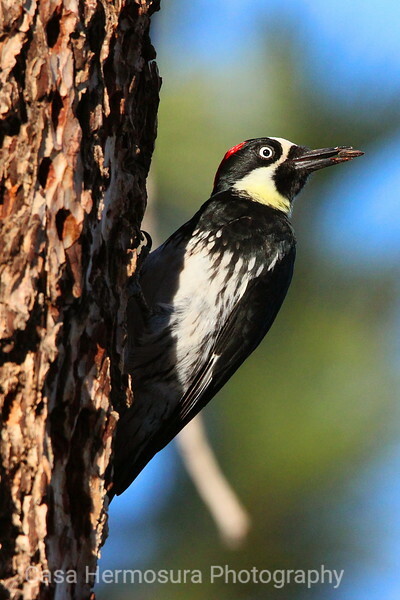 A few minutes after getting home from work last night, in the empty lot across the street, just above the south fork of Pueblo Canyon, this Acorn Woodpecker kindly let me get as close as I wanted. 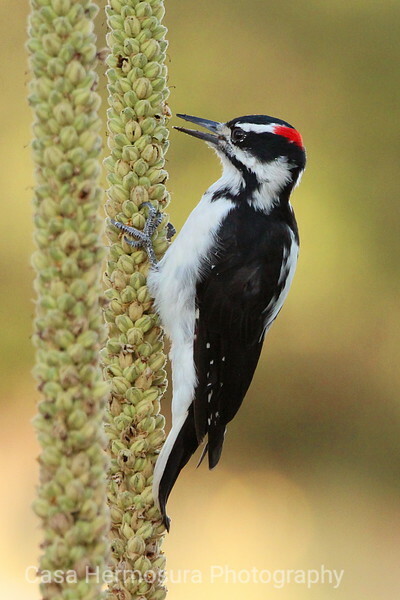 She was working holes in a dead ponderosa, looking for the seeds she had stashed over the fall and winter. Eventually, she pulled out this sunflower seed—likely one she found at my feeder across the street. She even leaned back to let the evening sun light up her face, and then she turned for a nice portrait. Lately, I’ve been pretty caught up in the chase of bigger and more difficult to find subjects. But as I was going back through a few photos from just a month ago, I was reminded that sometimes, my favorites are the birds and wildlife I see every day. Favorites because of that occasional luck with the camera equipment, when a photo turns out particularly crisp for mostly coincidental reason. The things I miss when I’m creeping around trying to get the photos, I can marvel at later when I’m lucky enough to capture a crisper photo: the lines along the bill, the color of the eyes, the sharpness of the talons, and of course, the texture and details in the feathering. Here’s one I especially like, though she’s just a plain ol’, black-and-white, yard bird. 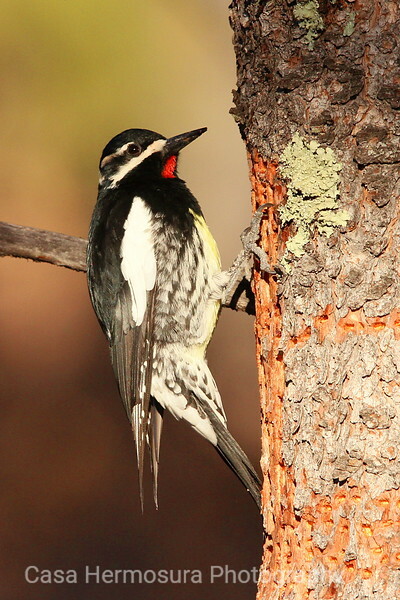 I found this woodpecker on Saturday evening, as I hiked the Perimeter Trail just above town. The sun had sunk low behind some clouds, keeping me from getting a decent shot. So, I went back up this morning, and somewhat surprisingly, I found it in the same location. Not totally happy with those photos and a bit curious, I went back up this afternoon, and found it in the same tree as Saturday. Creatures of habit, apparently, I’ll look forward to finding it on a lower branch! They obviously had a taste for aspen sugar. Neat, long lines of small, circular holes had been drilled in my trees, and he was now sharing the gushers with another male and a female. 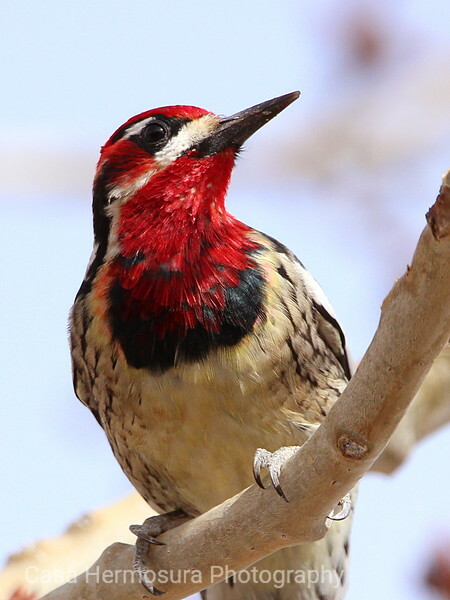 Every now and then, one of them would drill another hole, the drum beat of their bill loud and irregular. They each climbed up and down the tree in jerky movements, weaving in and around the branches, and avoiding buds about to leaf out. And they didn’t mind me, allowing me to get close, and only looking up occasionally, as in this shot, to see just what I was up to. 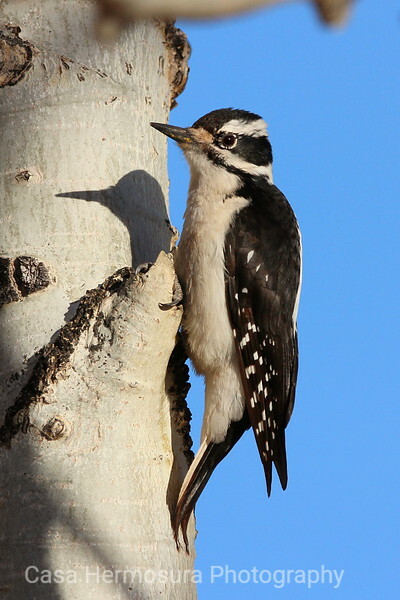 They are my favorite of the eight local woodpeckers. While all the other birds flew away as I approached, he stayed perched on his branch unconcerned. Even the Red-tail, with nothing to fear, wouldn’t let me within a couple hundred feet. But his highness let me walk right up as he posed for me. The acorns are nowhere to be found this year, so he was feasting on late season bugs. For now, however, he was content to rest, and watch me watching him. His breast feathers bled black into white. 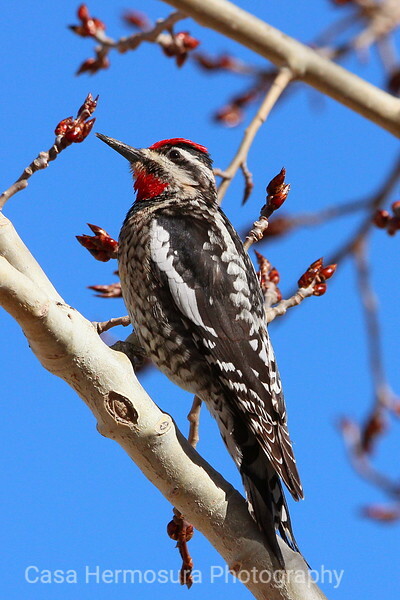 His ruby crown stood out in contrast against an unblemished, New Mexico sky. His talons were securely set into the branch of a dead ponderosa. And his tail feathers hung low below the branch in perfect shadowed symmetry. As I raised my camera, it was as if he knew what I wanted. He turned his head, he let the early morning sunlight put a glint in his eye, and he fixed his gaze on my lens. It was as if we had an understanding, and I walked away assuming it to be so. I love how these woodpeckers pose, and how they don’t seem to mind my approach.